Key facts about Robert Anderson who commanded Fort Sumter during the engagement that started the American Civil War. Robert Anderson’s father was a slaveholder who served as an officer in the American Revolution and was a charter member of the Society of the Cincinnati. Robert Anderson’s mother was a first cousin of Chief Justice John Marshall. Robert Anderson’s brother, Charles Anderson, served as Governor of Ohio from 1865 to 1866. Robert Anderson graduated from the United States Military Academy on July 1, 1825, 15th in his class of 37 cadets. Following his graduation from the United States Military Academy Robert Anderson was brevetted as a second lieutenant with the 2nd U.S. Artillery on July 1, 1825 and then promoted to the full rank of second lieutenant with the 3rd U.S. Artillery on the same day. Robert Anderson left the army from October 1825 to July 1826 to assist his brother Richard who was commissioned as Envoy Extraordinary and Minister Plenipotentiary to the Panama Congress of Nations. Robert Anderson campaigned as a colonel of Illinois volunteers against the Sac Indians during the Black Hawk War (May–August 1832). Robert Anderson was promoted to first lieutenant with the 3rd Artillery on June 30, 1833. Robert Anderson served as an assistant instructor and instructor of artillery at the United States Military Academy from September 10, 1835 until November 6, 1837. Robert Anderson campaigned against the Seminole Indians for two years during the Second Seminole War (1835-1842). During his time in Florida, Robert Anderson contracted fevers from which he would suffer recurrently for the rest of his life. From May 9 to July 7, 1838, Robert Anderson served as Major-General Winfield Scott’s aide-de-camp. On October 23, 1841, Robert Anderson was promoted to the rank of captain with the 3rd Artillery and returned to garrison duty. On March 26, 1842, Anderson married Elizabeth Bayard “Ezra” Clinch. Their marriage produced five children. Through his wife’s inheritance, Robert Anderson briefly owned slaves when his father-in law passed away in 1849. Robert Anderson served with General Winfield Scott’s invasion force during the Siege of Vera Cruz (March 9 – 29, 1847), and was engaged at the Battle of Cerro Gordo (April 17 – 18, 1847) during the Mexican-American War (1846 – 48). On September 8, 1847 Robert Anderson was severely wounded during the Battle of Molino del Rey, one of the bloodier engagements of the Mexican-American War (1846 – 48). Robert Anderson was brevetted to major “for Gallant and Meritorious Conduct in the Battle of Molino del Rey,” effective September 8, 1847. 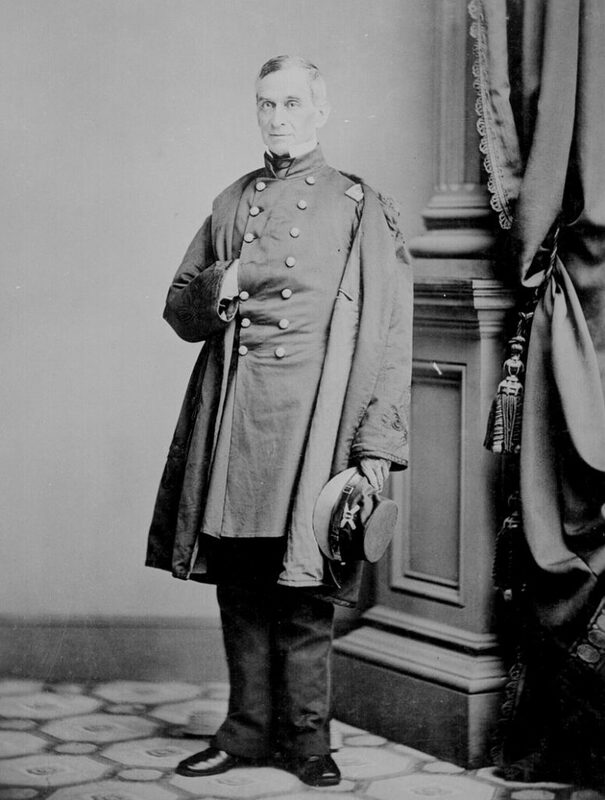 On October 5, 1857, the army promoted Robert Anderson to the rank of major with the 1st U.S. Artillery. On November 15, 1860, Secretary of War (and future Confederate general) John B. Floyd ordered Robert Anderson to relieve John Gardner as commander of the federal garrison at Fort Moultrie in Charleston Harbor, South Carolina. On April 14, 1861 Robert Anderson evacuated Fort Sumter. Although Anderson considered his inability to hold Fort Sumter as a failure, he was soon surprised to learn that he had become a national hero. In recognition of Anderson’s service to his country at Fort Sumter, President Lincoln promoted Robert Anderson to the rank of Brigadier General in the regular army effective May 15, 1861. On May 28, the War Department ordered Robert Anderson to take command of the newly created Department of Kentucky, which included as much of the state of Kentucky that lay within one hundred miles of the Ohio River. On August 15, 1861, the War Department issued General Orders No. 57, which effectively replaced the Department of Kentucky with the Department of the Cumberland commanded by Robert Anderson. On October 7, the War Department issued General Orders No. 6, directing Major General William T. Sherman to relieve Robert Anderson as commander of the Department of the Cumberland due to illness. On April 14, 1865, Robert Anderson returned to Fort Sumter to ceremoniously raise the Stars and Stripes over the stronghold that he had been forced to evacuate earlier (four years to the day). Robert Anderson was buried with full military honors at the United States Military Academy Post Cemetery, West Point, New York.